Sounding City is an annual exhibition that explores sound art and the boundaries between art, sound and music. The various installations bring together the three different disciplines. Tangible sound. Audible image. Sound of Silence focuses on quiet or barely audible sound work by sound artists. There is increased attention for silence in our society. In the bustle of today’s city, there is more than ever a need for quietude. Yet silence is also the benchmark against which sound is measured. No matter how paradoxical it may sound: silence and sound cannot exist without one another. Many sound artists share this fascination and create installations on the fringes of the audible. As a reflection on sound or as an invitation to more intense listening. Sound of Silence mixes works of both Flemish and internationally renowned artists, and starts with an opening performance and a concert on the same theme. In her work It takes courage and breath to speak up, Eleni Kamma shows the silence before words are spoken. The moment when everything is still unspoken, when everything is still possible. 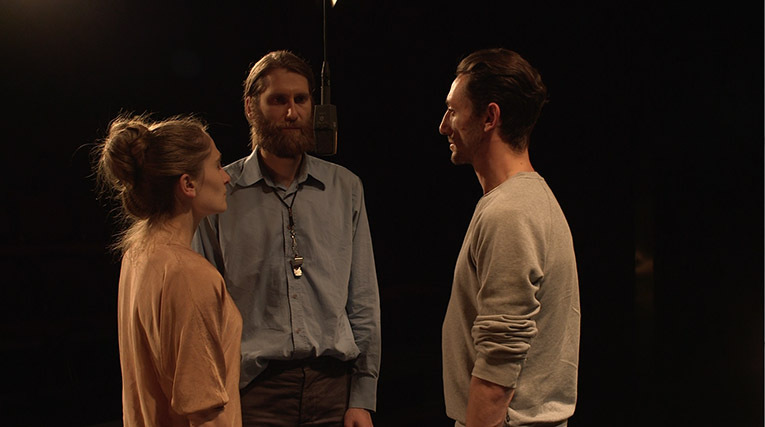 The camera makes circular movements, choreographs and records three people around a microphone. They are a silent group, but gradually they break free to follow their own course. Kamma worked on the theme of ‘parrhesia’. For the ancient Greeks this not only meant ‘ to speak out frankly’, but especially the obligation to speak the truth in function of the common good, even at the risk of personal jeopardy. To say what one thinks, one has to take a deep breath and overcome one’s fear. Open during the weekends from 2pm till 6pm.